The new Prestige Touch 2 from Luvion is an update on the original Prestige Touch. Equipped with a large 7" screen to monitor your child's room in detail with a higher resolution compared to its predecessor. 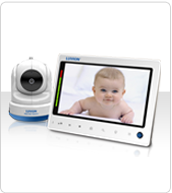 This baby monitor has won awards all over the world, it has among others been named best baby monitor in the Netherlands (Consumentenbond) and the UK/Australia (Mother & Baby Magazine). The new camera can pan, tilt and zoom while being remotely controlled from the parent unit. The Prestige Touch 2 is capable of recording video footage onto an SD card. Up to 4 cameras can be connected to the parent unit at once allowing you to monitor up to 4 different rooms using the same receiver unit. The screen can be placed into split screen or quad screen viewing modes and each camera supports infrared night vision and room temperature monitoring. A encoded video signal between monitor and camera ensures a 100% secure and interference free connection. Data Lock Encoding also prevents interference with your wireless internet connection. The camera can be controlled remotely and pointed into nearly every direction. The wall/ceiling bracket and mirror image switch on the camera makes sure you can mount the camera literally anywhere you want. Up to 4 cameras can be connected to the monitor (seperately available). Nightvision is automatically activated when necessary andhas a reach of up to 5 meters. Volume and sensitivity of the monitor are easily adjustable. VOX mode allows for automatic activation on sounds at the camera side. Visual sound notification through LED lights. Image and video recording on a SD card.